Figure K1. The famous photograph, taken November 1934. 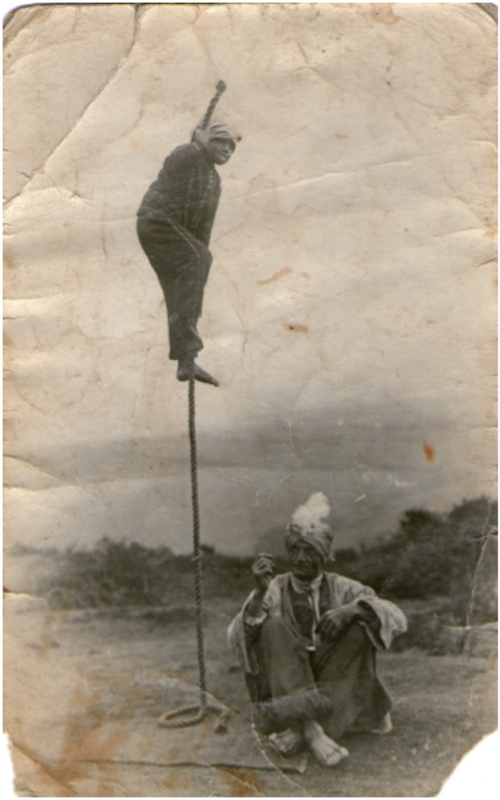 The first of the above photographs (figure K1) has been for almost eight decades the most recognised image of the Indian rope trick. Now, in this internet age, it is world famous, yet very little has been published about the man and the boy in the photo or the circumstances surrounding the taking of the photo itself. 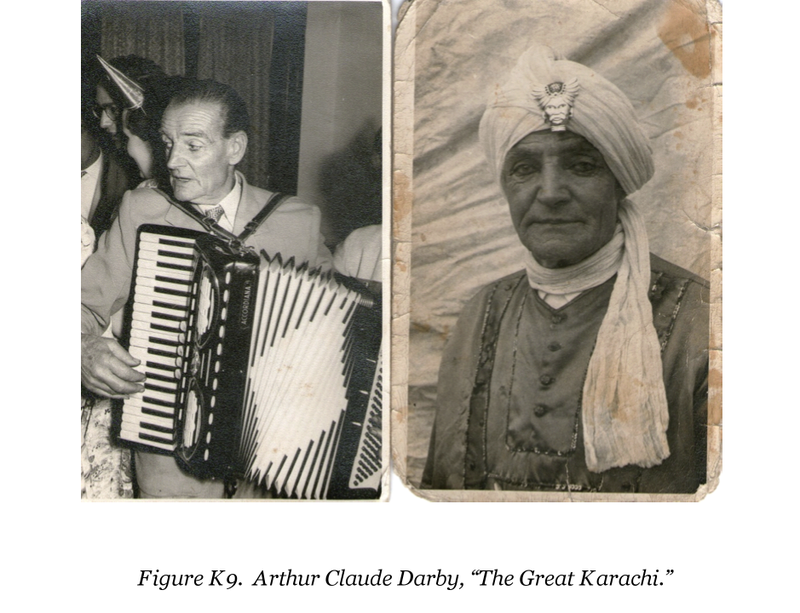 The magician pictured was Englishman, Arthur Claude Darby, who called himself “The Great Karachi.” He was by far the most interesting of the western magicians who took up performing the Indian rope trick, and this is his remarkable story. Arthur Claude Darby was born on April 5, 1888, in Birmingham, England. He was the second son of Horace Charles Darby, a watchmaker and jeweller, and Horace’s wife, Rebecca. Little is known of his youth, but he probably did an apprenticeship, for Arthur’s son, Horace (Horrie), told me his father was a fitter; and indeed in 1948, when Arthur migrated to Australia, his occupation was given on the ship’s passenger list as “fitter and turner”. Probably this was stated because Australia at the time was seeking skilled migrants. There is a document from 1907, a Great Western Railway employment record from Birmingham station, which tells us that Arthur Claude Darby, born April 5, 1888, entered service as a cleaner on September 9, 1907 at the rate of two shillings and eight pence (per week? per day? the document does not say). But this was obviously a temporary job, for Arthur is recorded as leaving the service on November 5 in the same year. Very early in his life Arthur must have discovered magic as an interest, and the knowledge he had from watching his father at work and from his own apprenticeship would have stood him in good stead for building his own equipment in his later life as a magician. He had the interest and the tenacity to practise sleight of hand, too, for throughout his life he was admired for his manipulation of playing cards. As well, Arthur had great artistic talent, and sometimes we find him occupied as a sign writer and as a mural painter. But primarily, Arthur was a fairground showman, and like all showmen he had occasionally to turn his hand to other occupations in order to survive. The story Arthur told, when speaking or writing about his famous rope trick, was as follows: when serving in France in World War I, he rescued the broken body of a Ghurka soldier from beneath the wheels of a gun carriage. During the injured man’s last days Arthur spent much time by his bedside, telling him funny stories and entertaining him with conjuring tricks. The Ghurka laughed at his stories and tricks, and before he died he taught Arthur the secret of the rope trick. When I suggested to Horrie that this was very likely just a magician’s patter story, Horrie said no, it was the family’s understanding that this story was true. My own opinion is that the story probably is basically true, but some details are likely to be a showman’s embellishments. For example, in one newspaperman’s story from 1935 the Ghurka’s name is given as Bowden Din. This is nothing like a typical Ghurka name, but does bear a surprising likeness to some old family names from south-west England where Arthur was living at the time. On the other hand, Arthur was later to claim that he was “the only man in the world who actually performs the Indian rope trick (genuine).”  This claim is likely to have stemmed from his own belief that he had been given a genuine Indian secret, whereas other western magicians such as Devant and Goldin, who featured the rope trick on stage, used regular western stage illusion methods. In November 1919 Arthur and his younger brother Percy applied for a patent for a “holdfast,” a device to secure or hold in position objects such as pipes. The patent publication date was February 7, 1921, and the U.K. patent number is GB158629. The illustration shows a U-shaped clip which can be secured by a screw, and a sliding plate which quickly locks into position. Arthur was a clever inventor, and this is not the only patent which he held. A family story tells of another invention which was hijacked by a manufacturer even though Arthur had it patented, but lack of money meant he could not assert his patent rights, and all the profits went to others. Between the two World Wars Arthur disappeared into the world of the travelling showmen, where records are largely non-existent. He travelled not only in Britain but in Europe also, performing magic, illusions and ventriloquism. He also appeared in London music halls. Before 1934 he worked under the professional name of “Phantom.” At this time as well, he and his wife were raising their family. Arthur married Mary Agnes (“Polly”) Bristow. Curiously, Arthur’s mother, Rebecca, had the maiden name Bristow. Polly’s marriage to Arthur was her second marriage; Polly’s maiden name was Poole. Arthur and Polly had seven children, listed for me by Horrie as Iris, Margaret (Peggy), Cyril, Horace, Josephine, Gloria and Olive. Cyril, born in January 1924, and stage-named Kyder, was the boy who climbed the rope. Horace, born in 1929, is the last surviving child. I refer to him as Horrie, as his family does, to identify him amongst the male members of the family, for Arthur’s father had been a Horace, as was Arthur’s older brother. It was during the 1920s and 30s that the Indian rope trick became a big talking point around the world. Travellers’ tales of seeing the illusion outdoors in India were disbelieved by western magicians, who could not think of a way it could be done. People like Helena Blavatsky had said that the trick was an example of eastern mystic powers. The London Magic Circle objected to that, and came out fighting via their Occult Committee, whose chairman, Lt. Col. R. H. Elliot, spoke on BBC radio and wrote an article in the BBC’s periodical, The Listener, branding the trick a myth, and publicizing the Committee’s offer of 500 guineas to anyone who would perform it. The performance had to be outdoors away from trees and buildings, the rope had to be thrown up and defy gravity, and a person had to climb the rope and disappear at the top, in order to win the prize. Arthur, with a young family to feed, had his eye on that prize and on other rewards which had been offered. He had not performed his Indian rope trick up until now, but he made his preparations, put together new costuming, abandoned the role of “Phantom,” and became “Karachi.” Young Cyril learnt to climb the rope and became “Kyder.” It is said that Cyril even learnt to do acrobatics whilst at the top of the rope. In those days many magicians offered rewards for a performance of the Indian rope trick, ostensibly in an effort to discover whether the story of the feat was factual or just a myth. In reality, though, these offers were primarily just publicity stunts. Karachi applied whenever such a reward was publicized, but discovered that his applications were ignored or returned to him unanswered. This is an important point which I must emphasize. Those who, in the past, have claimed that the Indian rope trick was just a myth, have regularly referred to the unclaimed rewards offered for a performance as evidence that the trick never existed. I do not doubt that some reward offers, such as the 500 guineas of the Magic Circle and the 10,000 rupees of The Times of India, were issued in good faith. But, make no mistake, the majority of the rewards offered by private individuals, usually prominent magicians, were merely the trumpeting of performers seeking publicity for themselves. Arthur Darby received shabby treatment at their hands, but, as we shall see, he was to rise above it in spectacular fashion. 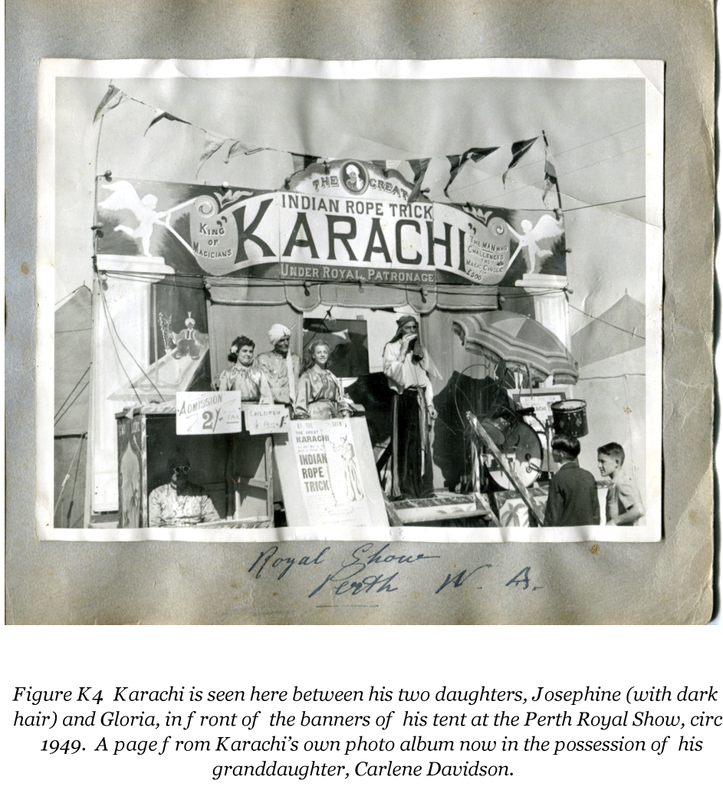 In late 1934, when the showmen’s caravans were at their winter quarters at Richmond Walk, Devonport, Karachi approached a Plymouth photographer, Mr J. Lewis, and asked if he would like to take some good photos, telling him that he was the only man in the world who could perform the Indian rope trick. An appointment was made, and either Mr Lewis or his son Reginald, or both, took photos of Karachi levitating a rope in the middle of Richmond Walk with the showmen’s caravans in the background. The two performers were then driven to Roborough Downs on the edge of Dartmoor where they repeated the rope trick for a photograph with Kyder climbing the rope well away from any trees or buildings. This is the famous photo which heads this article. Three of the photos taken, including the famous one, were published for the first time in the Western Morning News (Plymouth, England), of November 22, 1934. 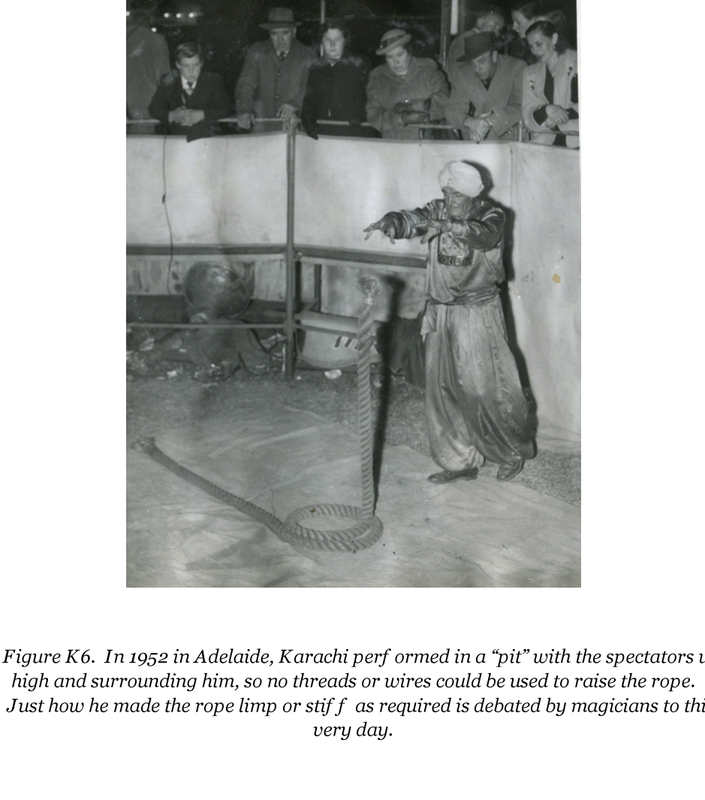 The captions stated that the photographer was Mr J. Lewis, and also that Karachi was prepared to perform the trick with any rope before any public assembly in the city, and he offered to pass around the rope after any demonstration so that it might be cut up or otherwise examined. The showmen’s newspaper, The World’s Fair, put the photo with Kyder up the rope on its front page in the issue dated December 1, 1934, and accompanied it with a promotional story on page 41. Again, the photographer’s name was given as Mr J. Lewis. It cannot be established with certainty whether the photos came from the camera of Lewis senior or that of his photographer son, Reginald. Wilfred J. Wilcocks of Newquay sent the photos on to The Listener, saying that in the Western Morning News of November 24, the photographer, Mr J. Lewis of Plymouth, declared that the photos were perfectly genuine and that he himself examined the rope that was used. The Listener published two photos on December 5 with the Wilcocks letter. Two weeks later, Reginald Lewis had a lengthy letter in The Listener claiming that he had taken the photos and had examined the rope. His letter implies that he examined the rope at both locations. A fortnight after that, a Plymouth conjurer, Henry A. Goad, had a letter in The Listener, saying he had been present at the Richmond Walk demonstration though not at Roborough Downs, that the photographer was “Mr Lewis” without specifying father or son, and that the rope was coiled, uncoiled, waved around, but never handed out for examination. Goad also stated that the day the photos at Richmond Walk were taken was a Sunday in November; whereas the Western Morning News of November 22 made it clear they were taken just the day before, i.e., Wednesday, November 21, 1934. In view of these conflicting reports, it cannot now be established with certainty who took which photographs, nor do we know the exact day they were taken. There are copyright implications of all this. The photograph with Kyder up the rope began to be reproduced in many places, and so became famous. For many years afterwards, Karachi himself used this famous photo in his publicity and autographed it for fans. In late 1934 Karachi had the idea of performing the rope trick on football grounds or in other public places to raise funds for hospitals and charities, retaining only a reasonable percentage for his living. He believed perhaps 50,000 pounds could be raised in this way. But events took a strange turn. It was at this time that Harry Price entered the scene. Harry Price was an unusual figure in the magic world. He was an amateur conjurer, a member of the Magic Circle, and a friend of Lt. Col. Elliot who headed the Magic Circle’s Occult Committee. But unlike most magicians of his time, Price was prepared to entertain the possibility that some “supernatural” phenomena were genuine. Price had established a laboratory to test the claims of spiritualists and other claimants to supernormal powers. Whereas the Magic Circle’s Occult Committee was dedicated to denying all claims of the supernatural, Price approached all claims with an open mind – but also with a scientific eye, and a magician’s knowledge of trickery. Karachi had never claimed that his rope trick was in any way supernatural, and Harry Price never suggested that it was, either. But both men saw the possibility of great publicity with the trick. Karachi as a showman naturally needed publicity, but Price also was always seeking publicity for his laboratory work. The opportunity was opened for them by the fact that the Occult Committee had rashly declared the Indian rope trick impossible and had offered the 500 guinea reward for its performance. Price, together with the editor of The Listener, arranged for Karachi and Kyder to come to London and perform their version of the trick in the open air. 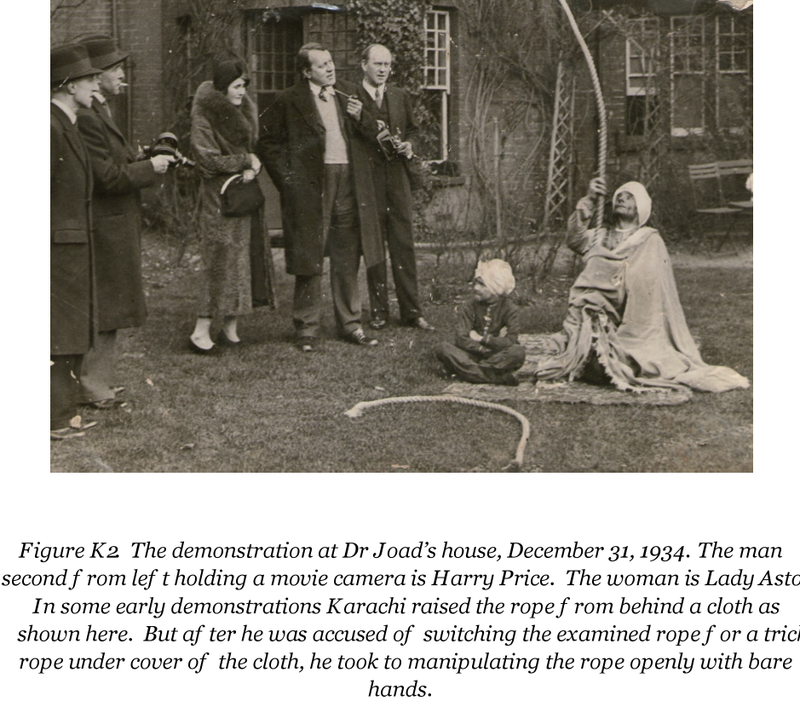 Some preliminary feats were performed on December 31, 1934, and some excellent photos exist of Karachi and Kyder in their costumes with the rope erect at Dr C. E. M. Joad’s house at Hampstead. Joad was a well known philosopher, writer and broadcaster of the time, and also a friend of Price. 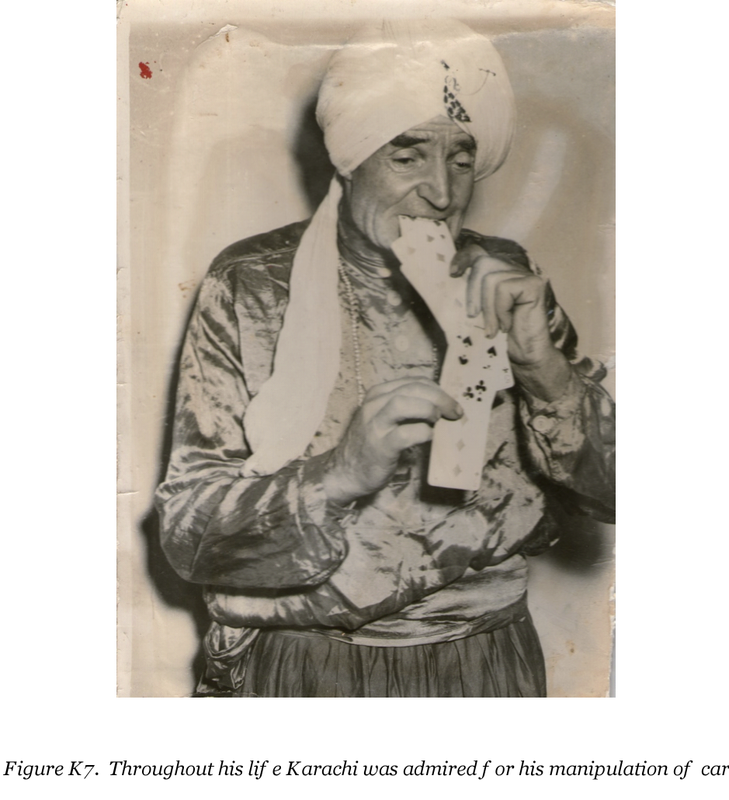 Then Karachi turned his guns on Lt. Col. Elliot, and continued, “the Occult Committee of the Magic Circle … say they have searched far and wide for a performer of the Trick, and have offered five hundred guineas to anyone who can perform it. Now, Sir, these gentlemen have never faced Karachi, and Karachi will issue them a challenge….let them offer a reward of not five hundred, but of two hundred guineas, and I will perform the first part of the Rope Trick to their satisfaction upon the following terms”. 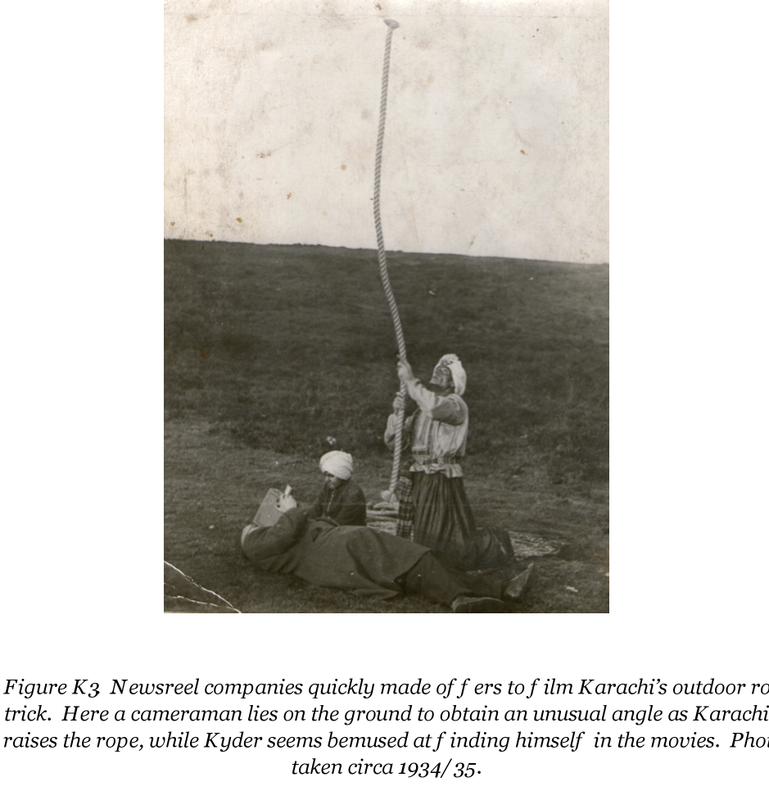 His terms were straightforward: the sum was to be lodged with a neutral party who would decide whether the performance was satisfactory; the rope would rise to a height of ten feet, Kyder would climb it, and remain at the top for 30 seconds to be photographed; the rope would be supplied by any well-known rope manufacturer, Karachi only specifying that it should have “a good grip”; the open place for performance would be chosen by the neutral party, but Karachi wanted access to it for 48 hours beforehand without being spied upon; and the rope would be handed to him after examination at the commencement of the performance, with the spectators remaining at a distance of not less than 15 yards in front of the carpet which marked out his performing area. The Magic Circle’s Occult Committee had staged a big meeting on April 30, 1934, where magicians and prominent people with much experience of India thought they had killed the Indian rope trick story stone dead. That was when the 500 guinea reward was first announced. But now, nine months later, things were getting out of hand! Elliot made it clear the original offer still stood, but he wanted a disappearance of the boy at the top of the rope, and his purpose was to destroy the idea that the trick was supernatural. He was, he said, not interested in Karachi’s rope trick as it was merely “a conjuring trick.” From Elliot’s point of view, believing the complete trick was impossible, and believing that Blavatsky’s “mystic” theory of it was a foolish superstition, he felt justified in attacking Karachi in true military style. Karachi’s challenge was never accepted, but he had reaped months of free publicity, and his fame was greater at this point than at any other time in his life. To this day, not only some members of the Magic Circle, but magicians generally, have cause to regret that his challenge was never taken up. What he said he would do, on a raised table, out of doors, away from trees and buildings, would have been quite incredible. He would not have made this very public challenge if he could not deliver the goods. The two men had obviously become good friends, and had milked the situation for all they could get, resulting in splendid publicity for them both. After the war, in 1947 Cyril migrated to Australia, settling in Perth, W.A. He worked as a machinist for G. G. Martins Electrical Engineering firm. Cyril must have given a very favourable picture of opportunities in a new land, for on December 10, 1948, Arthur and Polly, together with their three youngest daughters, Josephine, Gloria and Olive, left England on the migrant ship, M. V. Dorsetshire, bound for Western Australia. Cyril was their sponsor. Horrie was still in the army in Egypt, but met up with them briefly at Port Said. He was to follow them to Australia later. During the voyage Arthur performed his rope trick for the passengers and crew, although no one climbed the rope on board ship. This exchange looks very much like a publicity stunt arranged by the two letter writers, and is reminiscent of the Harry Price – Karachi exchange in The Listener in England years earlier. Digging down into old documents, magician and journalist Jamie Bentley, who had been a member of the West Australian Society of Magicians (WASM) in the 1950s, uncovered some old lists of members which contained the two names, A. Darby and L. Flood. This certainly seemed to add weight to the idea that this exchange of letters was a conspiracy. Yet, when I questioned them, the more senior members of WASM could not remember Karachi attending any club functions, although some did remember Karachi’s performances in Perth. But Karachi was a loner in the magic world. He was very secretive, not a joiner of magic societies, and always suspicious that other magicians were trying to delve into his secrets, and especially into the secret of his rope trick. Perhaps his experiences in England with the pretended “rewards” offered by prominent magicians for a performance of the rope trick affected his opinion of other magicians permanently. Jamie Bentley also has a distinct memory of Karachi hissing at the rope which lay in a coil. The showman would take a deep breath, then hiss loudly as he sent up each coil, until the end of the rope almost touched the top of the tent about 12 feet above the ground. Both witnesses thought the hissing was simply showmanship, and not an effort to cover up some other sound. Both thought it very effective and memorable. Jamie remembers the trick being performed in the centre of the tent with an audience standing all around. Mike, on the other hand, saw performances where there was a stage on which Karachi performed illusions and his card manipulations (which were his best feats, Mike thought). But when it came time to do the rope trick, Karachi stepped down onto the grass in front of the stage, and the keen-eyed Mike, in the front row of seats, was only about one and a half metres from the spectacle of the rope rising and collapsing. This, then, seems to be the version of the trick with which Karachi toured around Australia. In 1952 he worked with the promoters, Greenhalgh and Jackson, who ran many sideshows in the “sideshow alleys” of the Royal Agricultural Shows. These Shows ran consecutively around the entire country. This was the “show circuit” which had showmen working for much of the year. Several excellent magicians worked this circuit very profitably in those days. Sadly, today, the entertainers are gone, and the sideshows only have games and rides. Newspaper advertisements from 1952 indicate that Karachi appeared in Sydney in April of that year, Cairns in July, Brisbane in August, and Adelaide in September, and of course many smaller towns in between. Yet, surprisingly, I have found no magicians in the eastern states who remember him. This really underscores his secrecy and unwillingness to mix with other magicians. Things changed for Arthur in the late 1950s. His family had grown up and moved on to live their own lives, and Arthur toured less and went to board with a widow in Perth named Beatrice Barlow Joyce. The companionship must have suited them both, for he lived with Beatrice for many years in Wellington Street, East Perth. 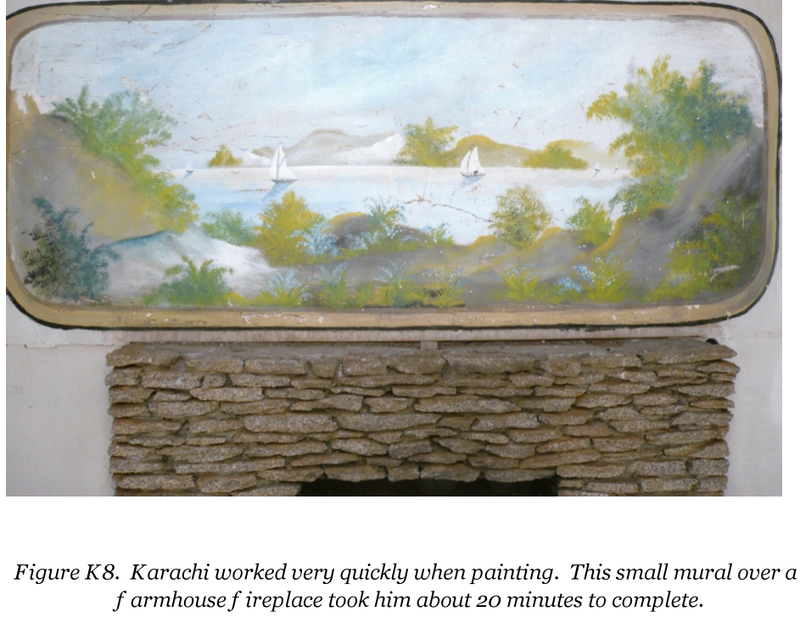 He painted the front of her weatherboard house with murals which made it quite a local attraction for a long time. Beatrice’s granddaughter, Maureen Roberts, remembers him as “Uncle Arthur,” and as a wonderful artist. Maureen’s parents had a beautiful lake scene painted by Arthur over the fireplace in their home, and the neighbours next door had a mural of white swans on a lake. Arthur also painted murals in public places around Perth, signing them “A .C. Darby,” but none seem to remain today. To magicians it is evident that Arthur had several different methods for performing his rope trick. I do not doubt that he obtained a method in his early years which he regarded as a “genuine Indian method.” But his inventiveness, and his adoption of the trick as his signature piece, meant that he developed the Indian rope trick to a greater extent than any other 20th century magician until the time of the Indian performer, Ishamuddin, in the 1990s. Maureen Roberts remembers her Uncle Arthur as a snappy dresser, and always well groomed. She also remembers another curious fact. It seems Karachi soaked his ropes before a show. Maureen remembers the ropes soaking in some solution in the cement troughs in the laundry. It sometimes caused trouble with the womenfolk when they wanted to wash! He was fastidious about appearances, so was he simply washing his ropes? Or did he impregnate the rope with some “solution” which made it rigid or slack as he required? Today’s magicians know of no such product. But if there was such a substance, it could well explain how he could make his 500 pound guarantee that there was no mechanism inside the rope, and nothing attached to the rope to draw it upwards; and the rope really could be examined and cut up afterwards without revealing any secret mechanism. Personally, I think he was just washing his ropes, but who knows? Arthur’s son, Horrie, still has two of his father’s ropes, just ordinary manila ropes about as thick as a man’s arm. Horrie told me how sometimes when travelling an emergency would arise where a vehicle had to be towed. Karachi would bring out the Indian ropes, and they would be used as towropes. This story seems to negate the theories of those who postulate some ingenious or delicate mechanism inside the rope. The tendency towards secrecy has come down in the family. 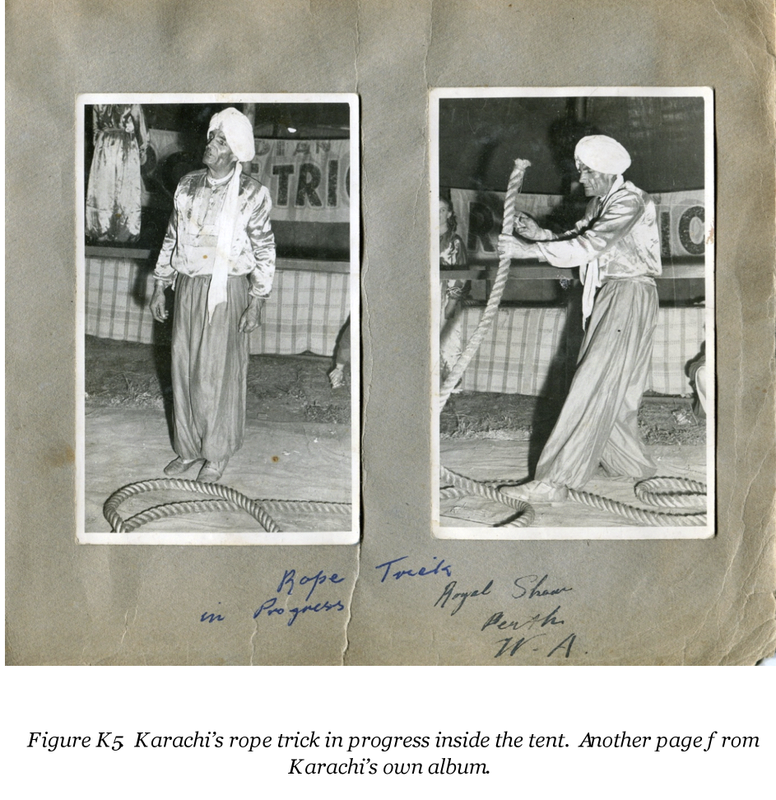 When I first spoke to Horrie, one of the first things he said to me was, “I don’t know how the rope trick was done, and if I did know I wouldn’t tell you!” Karachi’s granddaughter, Carlene, told me that her mother, Gloria, knew how the trick was done but would not tell her children. She said a magician’s secrets should die with him, and the old showman’s grandchildren accepted that. Carlene says, “In fact, it is nice we don’t know as it then can’t be exploited and it keeps the mystery alive.” Karachi would be delighted that his secrets are still secure! But as long as magic enthusiasts discuss the Indian rope trick, this father and son will never be forgotten. Their robed figures against the background of the Devon moorlands form THE enduring image of the most famous of all magic’s illusions. The name Arthur Claude Darby is often misspelled in magicians’ literature and other documents. The spelling I give here is in accordance with his birth certificate, his tombstone, and family usage. I first interviewed Horrie Darby by phone on January 22, 2013. Passenger list for M.V. “Dorsetshire” of the Orient Line, voyage departing Liverpool December 10, 1948. Originally from an unnamed English source, this story was retold in the Mirror (Perth, W.A. ), Saturday, June 15, 1935, page 9; and also in the Barrier Miner (Broken Hill, N.S.W. ), Saturday, July 13, 1935, page 6. Advertisement in The Stage (London, England), Thursday, November 9, 1944, page 5. The World’s Fair (England), Saturday, December 1, 1934, page 41. Blavatsky, H.P., Isis Unveiled (Bouton, N.Y., 1877), Part I, chapter 13. The Listener (London, England), Wednesday, May 16, 1934, page 843. Western Morning News (Plymouth, England), Friday, November 23, 1934, page 8. The Listener (London, England), Wednesday, December 19, 1934, page 1043. The Listener (London, England), Wednesday, December 5, 1934, page 959; and Western Morning News (Plymouth, England), Saturday, November 24, 1934, page 10. The Listener (London, England), Wednesday, January 2, 1935, page 36. The National Archive of Australia has a copy of this photograph (image no. A1861:7671) autographed with the words, “Yours truly Karachi and Boy Kyder.” The Archive dates it to 1955. Western Morning News (Plymouth, England), Friday, November 23, 1934, page 8; and The Listener (London, England), Wednesday, December 19, 1934, page 1043. The Listener (London, England), Wednesday, January 16, 1935, page 98. This article, somewhat edited, was reprinted as Chapter XXI of Price’s book, Confessions of a Ghost-Hunter (Putnam, 1936), but in the book Price’s suggested method of how the trick was done was omitted, as was the editor’s footnote. Dundee Courier and Advertiser (Dundee, Scotland), Monday, July 15, 1935, page 6. The Listener (London, England), Wednesday, January 23, 1935, page 163. The Listener (London, England), Wednesday, January 30, 1935, page 204. The Listener (London, England), Wednesday, February 6, 1935, page 252. The Listener (London, England), Wednesday, February 13, 1935, page 294. The Listener (London, England), Wednesday, February 20, 1935, page 334. The Listener (London, England), Wednesday, March 6, 1935, page 421. The Listener (London, England), Wednesday, March 20, 1935, page 506. Tabori, Paul, Harry Price – the Biography of a Ghost-Hunter (Sphere Books, 1974 – the Dennis Wheatley paperback edition), page 60. Arthur’s granddaughter, Carlene, daughter of Gloria, told me this in February 2013. These details of Cyril’s life come from his brother, Horrie. Horrie told me of ENSA. The other details in this paragraph come from a letter published by Karachi in The West Australian (Perth, W.A. ), Monday, January 31, 1949, page 17. The Stage (London, England), Thursday, September 14, 1944, page 5. The Stage (London, England), Thursday, November 9, 1944, page 5. The West Australian (Perth, W.A. ), Tuesday, January 18, 1949, page 7. The Daily News (Perth, W.A. ), Saturday, January 22, 1949, page 19. The West Australian (Perth, W.A. ), Tuesday, January 25, 1949, page 11. The West Australian (Perth, W.A. ), Monday, January 31, 1949, page 17. These lists of members were printed on the backs of the menus for the WASM Annual Dinners for 1953 and 1958. For this amazing detective work, my sincere thanks are due to the office bearers and senior members of WASM who have been very kind to me. Even 102 year old Alfredo DeCampe took the trouble to write to me with his memories of Karachi. The names of these and other helpful past and present members are included in my “thank you list” below. Polly Darby’s death notice and funeral notice appeared in The West Australian (Perth, W.A. ), Friday, December 9, 1949, page 1. See, for one example, The Daily News (Perth, W.A. ), Saturday, November 11, 1950, page 22. PEOPLE, issue on sale October 18, 1950. I have not been successful in locating a copy of this issue. A collection of PEOPLE is in the National Library of Australia in Canberra, but this issue was not in that collection when my researcher, Jan Conoplia, requested it. The information given here is from a newspaper advertisement for it which can be found in The West Australian (Perth, W.A. ), Wednesday, October 18, 1950, page 10. Emails and phone calls exchanged with Mike Roeger, January, 2013. Emails and phone calls exchanged with Maureen Roberts, January, 2013. Letter from Peter Thorpe dated January 21, 2013. Jamie Bentley found the grave and photographed it for me: Karrakatta Cemetery, Roman Catholic Section ZA, grave no. 0125. The grant for this grave expired in 1999, but at the time of writing it has not yet been disturbed. The Lakes Memorial Park Cemetery, Mandurah, W.A., Section 1, grave no. 140. My special thanks to Arthur Darby’s son Horrie Darby and granddaughters Carlene Davidson and Sandra Thomson, and also to: Rene Ahnstrom; Australian National Archive; Jamie Bentley; British Newspaper Archive; Noel Clutterbuck; Jan Conoplia; Patrick Cordier; Alfredo DeCampe; Angela Greenwood and the National Fairground Archive, Sheffield, UK; Jim Hanney; Jenny Kohlen and the “Can You Help” column of The West Australian; The Listener Historical Archive; Jan Masson; Ian Moffat; Vicki Morrow; National Library of Australia; David J. O’Connor; Maureen Roberts; Mike Roeger; Dorothea Thompson; Peter Thorpe; Tom Tulp; Steve Walker; and finally many thanks to my “silent partner” who edits and puts my material online – couldn’t do it without you, Andrew!